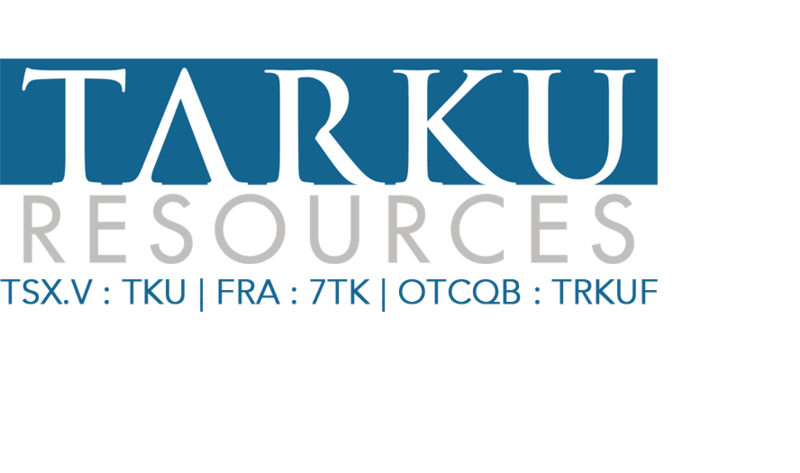 CRANBROOK, BRITISH COLUMBIA - Aug. 23, 2016 - Tarku Resources Ltd. (TSX VENTURE:TKU) (the "Company" or "Tarku") announces that it has amended the option agreement (the "Agreement") with Eagle Plains Resources Ltd. concerning the Tarku property (the "Property"), located in the province in Saskatchewan. Under the terms of the amendment, Tarku will acquire a 100% interest in the property and is not required to make further cash payments or complete work commitments. The Company also announces that it is renaming the project "Virgin River." The initial option agreement with Eagle Plains stipulated that Tarku was to make staged cash and share payments totaling $500,000 cash ($35,000 paid to date) and issue 1,200,000 shares of Tarku (200,000 issued to date) over a five-year period that started in 2014. The new terms allow Tarku obtain a 100% interest in the property by issuing two million shares to Eagle Plains. Eagle Plains will maintain a 2% Net Smelter Royalty in the Property, however Tarku can purchase 1% for $1,000,000. The amended agreement provides Tarku with much more flexibility in advancing the property, as it ensures that the Company can deploy the maximum amount of its capital on exploration, as opposed to making option payments. Sylvain Laberge, President and CEO of Tarku stated, "I am pleased with the outcome of the negotiations with Eagle Plains and its management and their desire to build a long term relationship." The Agreement is subject to the approval of the TSX-Venture Exchange. The Virgin River (formerly Tarku) property comprises four mineral claims totaling 18,400 ha overlying a large north-south trending area in northern Saskatchewan. The property is located along the Virgin River Fault, a major structure which forms the boundary between the Virgin River and Lloyd Domains. This feature creates a favorable setting for the deposition of significant structurally-related mineral deposits including the Dufferin Lake and Centennial deposits located 10km and 40km north of Tarku, respectively (management cautions that past results or discoveries on proximate land are not necessarily indicative of the results that may be achieved on the Tarku property). The area is underlain by mixed metasedimentary units, intermediate volcanics and significant felsic intrusive bodies, all of which have been affected by numerous structural events related to re-activation of the Virgin River Fault. Several well- defined northeast-trending geophysical conductors, verified locally by geological mapping, have been identified by historic airborne surveys. All of these features, in conjunction with significant gold values up to 2.26 g/t and anomalous base metal and uranium values throughout the property illustrate the exploration potential of this property for both gold and uranium deposits. This press release was supervised by Bernard-Olivier Martel, P. Geo., Qualified Person pursuant to National Instrument 43-101.